Students studying abroad in the U.S. gain levels of independence, which may not be available in their home countries. Along with the newfound independence, comes decisions regarding their healthcare choices and preventing pregnancy, if choosing to be sexually active. International students often have many questions about contraception, its availability, and cost. The U.S. has minimum essential benefits requirements for health insurance for its citizens under The Affordable Care Act or ACA. All non-exempt U.S. citizens are required to carry insurance meeting these requirements under the act. 100% birth control coverage is one of the provisions needed to meet the minimum qualification of an essential benefits plan. How Will I be Affected if I choose to study in the U.S.? Students studying in the United States on F1 or J1 visas, that have been studying in the U.S. for less than 5 years do not have to meet the minimum essential health benefits required under ACA. Students may choose their own private health care plan or participate in health benefits and student health insurance plans offered independently by the college or university. Many schools offer varied levels of student health services, either through university health centers or contracts with local providers or health clinics. If you have been studying and living in the U.S for longer than 5 years, then your federal income tax status will determine if you are eligible for subsidies under ACA. Any plan you choose, either through your school or from an eligible provider must meet the required essential health benefits under the act. As stated above, birth control is 100% covered under these requirements. Will my College or University Require me to Get Health Insurance? Mandatory student health insurance plan requirements for students with F1 or J1 visas differ by state and college or university. Some schools mandate student insurance through their school health plan. In most cases, enrollment in the school health plan is mandatory, and premiums are either incorporated into tuition or added on as mandatory enrollment fees. Although many of these plans may be more expensive than individual plans, they cover much more than individual plans without waiting periods. In addition, they offer extremely low deductibles and copays. As an international student, you will need to verify that coverage is available during holidays and semester breaks. You will also need to familiarize yourself on policies regarding travel. This is especially important if your home country does not have a national or socialized plan. In some cases, you will need to purchase an additional individual plan in case of emergency. Some colleges offer mandatory plans but allow students to opt out if they are covered under a separate policy through their parents or an employer. International students purchasing health insurance independently through an international group or individual plan may also opt out. If you choose to participate in an independent international student health plan, it is important to make sure that the plan meets the requirements imposed by your school. What if my School Does not Require a Mandatory Health Plan? If you are attending a school that has no policies mandating health insurance, it is still a good idea to invest in an international student health policy. Students with J1 visas are required by the U.S. Federal Government to obtain emergency medical evacuation coverage in case you need emergency medical transport to a hospital or trauma center. Many schools recommend or require international students to obtain health insurance policies with high or unlimited coverage maximums, lower deductibles, and coverage for benefits in special circumstances, such as maternity and mental health, as well as pre-existing conditions and repatriation of remains in case of accidental death. Are there any Federal Health Insurance Programs for International Students? At this time, there are no federal programs granting access to free healthcare for international students. Students from other countries studying in the U.S should become informed on individual requirements through their school or by international health plans. Some states, as noted above have incorporated supplemental policies to increase access to birth control. Please make sure to check what is available regarding contraception at the state and school level prior to your arrival in the country. Will a Student Health Plan Cover Birth Control? According to ACA mandates, any insurance policies with a start date of August 1, 2010 or later must cover at least one method in all 18 FDA-Approved contraceptive methods, without cost-sharing or copays. This includes, pills, vaginal rings, patches, implantable devices, injections, intrauterome devices (IUDs), and emergency contraception pills. Where can I get Birth Control Without a doctor’s Prescription? In order to obtain birth control directly from a pharmacist in these states, you need to physically be in that state. The minimum age requirement varies by state. Students and women in California have access to 4 methods from trained pharmacists: pills, patches (Xulane), vaginal rings (NuvaRing), and injections. Implantable devices and intrauterine devices still require visits to a provider or clinic offering these services. Can I get Birth Control Online? Online consultations are also available to women wishing to obtain prescription contraceptives without seeing a physician. The services require the user to answer a short questionnaire and may even offer home delivery. Some states do not participate in digital contraceptive prescription options. Where can I get Birth Control if I can’t Afford an Individual Health Plan and my School Doesn’t Have One? Many local health departments and Planned Parenthood receive funding for preventive health services through the government program called Title X Family Planning funds. In addition, many public clinics also have sliding-scale payment programs based on your income if you do not have insurance. Your university guidance center or health center may have databases and lists of local clinics and resources to assist you. Also, Pandia Health accepts credit cards and has a Pandia Health Birth Control Fund, which can cover medications and the telemedicine visit if you can’t afford it. However, the fund is limited to whatever donations it receives. For those in California, check out Family PACT which provides free birth control if you make <200% of the federal poverty level. What types of Birth Control are preferred by College Students? According to a 2012 study of students attending the University of New Hampshire, birth control pills were the most frequently used form of primary contraception at 58% followed by male condoms at 25%. Abstinence scored the third highest at 7%. IUD’s and the vaginal ring tied for 4th place with only 2% of surveyed students reporting it as their preferred method. Patches, injections, and Plan B were utilized less than 1% of the time. However, in 2018 more and more women are going to the IUD with hormone and the vaginal ring because of convenience and low side effects. 81% of the surveyed students reported using contraceptives for pregnancy prevention. 7% reported using methods, either primarily or secondarily, for preventing sexually transmitted diseases, and 12% report using contraceptives for other health concerns, including acne, and irregular or painful periods. What does this mean for International Students? 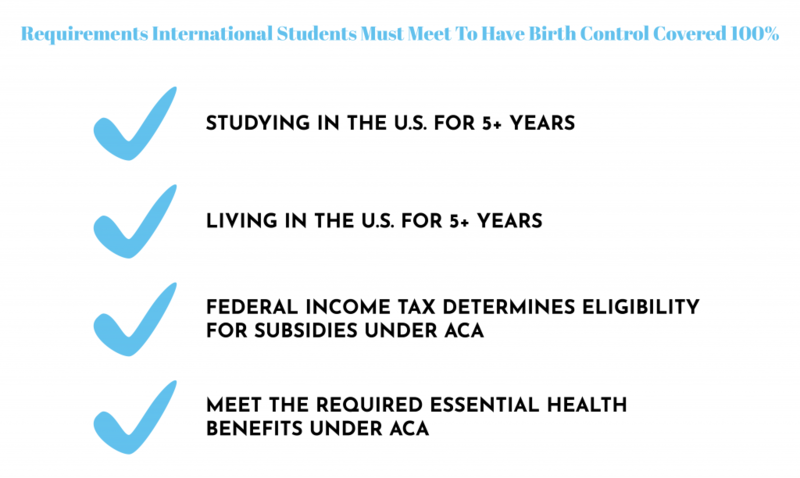 International students have many options available to access different contraceptive options in the U.S. Mandates under the Affordable Care make access to birth control universal for all women, desiring to prevent unplanned pregnancies. If you don’t qualify for subsidized essential health benefits under ACA, all student and international health plans are required to meet these requirements if purchased after 2010. This means low cost or free access to at least one method in all 18 FDA-Approved categories is available to all women with insurance plans beginning after 2010. In addition, multiple states have developed their own policies increasing access to contraception and lengthening prescription requirements to a 1-year mandatory supply. Three states already have policies in place allowing pharmacists to dispense various forms of birth control without a doctor’s prescription. International students wishing to attend colleges or universities in the United States should familiarize themselves with their school’s health coverage options as well as available independent international health plans for students. Students should also familiarize themselves with state policies on birth control access and low-cost alternatives offered by local clinics and health departments.